November 8, 2013 November 1, 2013 / Julie Brook, Esq. Not sure where to begin on your trial notebook? Start with your office files. The trial notebook is prepared from documents taken from existing office files, whether those files are paper or computer files. It’s essential that you set up office files when the case is opened so they can serve as an organizing tool throughout the litigation. If you didn’t set up your files at the outset, definitely do it as you approach trial. Simple cases may initially require only one file, and more complex cases may require several files. Different types of cases require different file categories. You’ll need a file index in all but simple cases. ideas on jury selection, opening statement, closing argument, jury instructions, and general trial tactics. Take care to protect these files: put document originals, or copies that will be treated as originals, in a locked, fireproof file cabinet and back up computer files, with the back-up file stored in a separate location for optimum security. It’s never too soon to rough out a trial notebook, but the time to actually assemble and complete the notebook depends on the complexity of the case. In a simple case, the trial notebook may not need to be put together until about a week before trial. Your trial notebook is only as good as your case preparation. 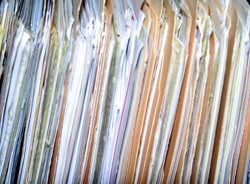 Well-organized office files help you see the case clearly so that you can fill in your own evidentiary gaps while taking advantage of weaknesses in the opponent’s case. Need advice on organizing your files and trial materials? CEB has you completely covered in California Trial Practice: Civil Procedure During Trial, chapter 3. For a complete list of tasks to do when preparing the trial notebook, see Effective Introduction of Evidence in California, chapter 3. Also, check out our program Everything You Need To Know To Be Ready For Trial, available On Demand.